Over 2,000 years have now passed from the actual moment of the Nativity of Christ, from that turning point in human history when God Himself came down to earth and became man, fulfilling the promise given to Adam in the Garden of Eden concerning the coming of a Saviour into the world. Our Lord Jesus Christ was not born in a palace, nor in a rich mansion, nor in circumstances of importance or grandeur, but in a dark humble cave used for sheltering animals. Near this cave noisily bustled the city of Bethlehem. In that year, over 2,000 years ago, Bethlehem was overflowing with people who had come to the city of their origin for the census. And all this multitude of people busily rushed around without even suspecting that the greatest miracle was taking place nearby – God Himself was coming down to earth and taking upon Himself the form of man. And not far away, in Jerusalem, civil authority in the person of King Herod and religious authority in the person of the Jewish elders were rising up in arms against the Infant Christ. Fearing to lose his worldly power, Herod raged in his hatred of Christ and prepared to kill Him. The Jewish elders knew very well that the Messiah, the promised Saviour, had come, but in their vanity and their pride they rejected Him. Over 2,000 years have passed, and we now find ourselves in similar but more terrible circumstances. Like the city of Bethlehem, modern mankind noisily bustles around, entirely submerged in secular life and not paying the least attention to the spiritual world alongside it. In our times, just as then, secular authority is up in arms against Christ, trying to kill Christ with persecution of Christianity, with abominable blasphemy, with desecration and revilement. Christ is being banished from all aspects of human life on earth. Christ is being eradicated from the souls and hearts of men. An attempt is being made to destroy His teaching and His Church through the terrible heresy of ecumenism. In our times, just as then, man’s vain and proud mind is consciously rejecting Christ, giving itself over to all manner of false teachings and the satanic seduction of technetronic wizardry. And just as in those days the Infant Christ quietly stayed in the humble cave of Bethlehem, so He now quietly resides in the humble hearts of those who believe in Him. But how can we find our way to this wondrous cave, so that the way to paradise would open up for us? The Church tells us that God came down to earth in order to raise us up to heaven. This means that in order to be able to rise to heaven, we must fulfill the conditions under which the Saviour came down to us. What are these conditions? We find them in the description of the Nativity of Christ. First of all, there is perfect humility. The Holy Scriptures tell us that God opposes the proud, but gives His grace to the humble. From His very nativity and throughout His entire life on earth, Christ Himself showed us the greatest example of humility. He was born in the humblest of circumstances, far from mankind’s terrible vanity. Thus, if we want to be united with Christ, we must reject all pride and vanity, because we have nothing to boast of in the eyes of God, we have nothing of our own except our sins. But some people may well ask in bewilderment: does God completely reject wealth, importance, wisdom, education? 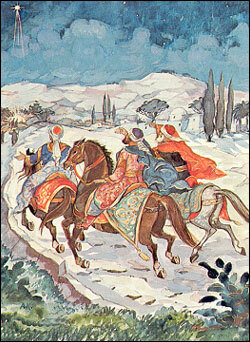 And in response to this we see the magi traveling to Jerusalem from far-away lands. They were wealthy, and important, and wise. In their own lands they were kings and astronomers. But they differed from the educated Pharisees and Jewish elders in that they united their great minds and their wisdom with ardent faith, with faith in what had been revealed to them by the bright star that had suddenly appeared in the skies – that God had come down to earth and that the King of the world was born. And this faith of the magi was so strong that they felt no embarrassment at finding the King of the world, the Lord God, in a dark and humble cave; instead, they knelt before Him in joy and awe, and gave Him their gifts – gold, and frankincense, and myrrh. Let us fill our hearts with the humility of the Infant Christ, the innocence of the shepherds, and the faith of the magi. Then our hearts, too, will shine with the heavenly light and the spiritual joy of the cave of Bethlehem, and for us, too, will open up the way to paradise. 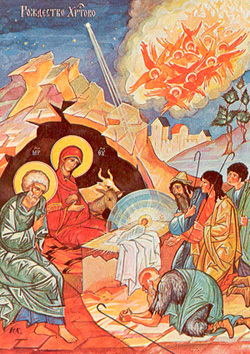 Christ is born – glorify Him!